Yesterday I hit 50,000 words on my WIP, the story of a military robot engineer who goes toe-to-toe with a Wendigo. I’ve been tracking my word count for the first time. 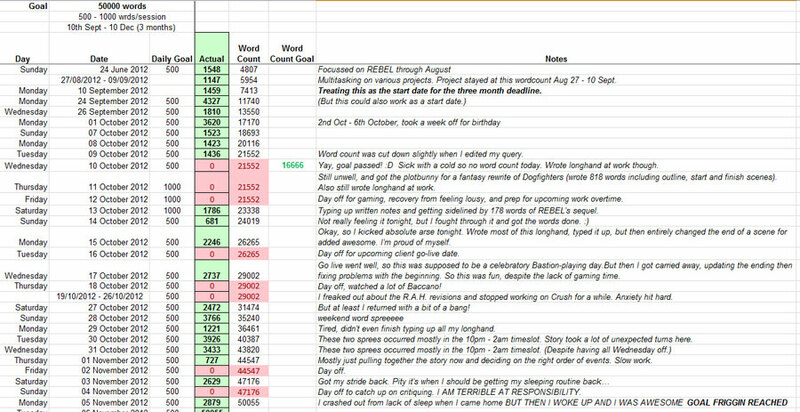 I usually frown upon using word counts to track productivity (I set a deliberately low word count target) because I believe word count obsession can lead to too little focus on quality writing, but I actually enjoyed using the spreadsheet. It was a powerful motivation factor and helped me see just how smoothly this draft went. The first month was a bit of a slog, and most of my writing was done by scene hopping from cool-scene-to-cool-scene and forming the world from that. At the end of October I hit this stride where everything started falling into place. I finally ‘got’ the story. That made it plain sailing for a while, even when I was doing the tricky part — stitching all my scenes together. Working through November was a nice way to finish the draft, I got to tap into the excitement of my writing friends starting NaNoWriMo and use it to fuel me through the final part. Definitely will try to arrange my schedule so I’m drafting during NaNoWriMo more often. My word count goals were, to write the WIP over 3 months: hitting 16666 words on 10th Oct, 33333 words on 11th Nov, and 50k by the 10th December. My actual results completely took me off guard. It took 21 days of typed writing, averaging 2381 words a day, plus a few extra days of scribbling long hand but not getting to type it up. The bulk of the work happened between 24th September and 05th November, so about a month and a half of writing, but the idea was left to form for a while between the initial draft and when I got started it. Two major interruptions were three days of sickness, and a week off for my birthday. Most of my writing happens after 10pm and runs up until 3am, and my life looks a lot like this: Work, Writing, Sleep. Pick two. I sacrifice sleep for writing during the week and oversleep at weekends. This draft is still just a first draft, and it has a lot of fixing up to do and words to add before it’s a ‘finished’ novel — but all in all, I’m proud of my speed, and I’m proud of the draft. It feels a lot more focussed than REBEL, and I’ve reached the point where I’m happy to let the story sit on the sidelines. I need some space from it, to mull over the ideas and let the plot percolate like a good cup of coffee. Still, it’s a good feeling. I’ve got another novel planned for the New Year, so hopefully I’ll be able to keep up the same momentum for that. The main thing I learned is: I write fast first drafts. REBEL’s first draft took me… two years, maybe, mostly due to life and rocky mental health, so I had no idea I could do this. And it certainly didn’t feel as fast as it looks on the spreadsheet. Next, I need to work on structuring my editing and redrafting for increased efficiency. Scene jumping is a hugely useful technique for me. Daily writing doesn’t work for me if I try to force it. I need to take breaks for my mental health and to let ideas ‘percolate’. And I need a much, much longer time to let a story concept stew before embarking on the 1st draft. A half-decent outline and an ending are essentials before I start. Working long hand is awesome, it stops me being faced with a blank screen when I open up Word. Scrivener doesn’t work for me. It just gets me distracted with fiddling settings. Word isn’t great, but it keeps me focussed at least. I definitely do have to sacrifice things when I hit my stride. Sleep is the main loss, but I also lose out on a lot of interaction with friends and my partner. And I get easily overloaded/stressed out, but because I’m actively being productive it’s easier to recognise that I’m overloading myself. It meant I could make people aware that I was stretched thin. Now I’m taking the day off, and starting on that REBEL revision tomorrow (it’s also been percolating while I’ve worked on this story, and I’m excited to pick it up again). I’m hoping to create another first draft for a different project in January with similar speed. Writers, how’s your work (NaNoWriMo or just general writing) getting along? Fantastic post, Emma, and congratulations on knocking out a draft in just three weeks. That’s fantastic — and inspirational, as well. I love that you’ve shared your spread sheet here, and I’m certain that serious writers all over the globe would benefit from the lessons you’ve included. Keep up the great work! It’s nice to learn more about your writing style and what works. I’ve written three full books now, plus some partials, and I’ve loved fine-tuning the process over time. Though overall I have a system now for drafting and editing, each book unfolds a little differently. Congratulations on hitting 50K, Emma!! NaNo’s going a lot better for me than I thought. I’ve discovered some things about the way I write that line up with some of the things you’ve noticed about yourself. For example, having a good outline/idea going in is critical, but not being too concerned with detail or even solving every plot issue beforehand–I’m surprised at how much “comes together” in the drafting process. There are plot issues I had prior to Nov 1 that I can see a solution for already. Also, I think this fast drafting is working for me. There have been times when I’ve thought “what now?” And before my inner editor kicks in, I just start writing dialog–or something, just to keep momentum going, trusting that the story will come through. I know there will be a ton of editing after Nov 30th, and a lot of my word count will end up in the digital trash can, but what’s left will be worth all the work. Woo, I can reply now that Livefyre sorted my comments! Definitely agreed on your advice re: a good but flexible outline, I find it can all work out as long as I know how it ends and have a rough idea of the big events ahead. Thanks for this insightful post, Emma. You and I have a lot in common productivity-wise. I don’t skip around, but I do need breaks and tend to hit my stride at a certain point in the novel when I too “get it” and everything seems to gel. I appreciate your putting this post out there. It’s nice to have a yardstick with which to compare my productivity so I know whether I’m being realistic about my goals. How do you find it works for you when you have a book in edits and you are writing a new book at the same time? I’m doing revisions just now with another draft on the side (much lower priority than the revisions), so I’m going to be trying to monitor it and see how I get on. I suspect the multitasking might cause my productivity to suffer, but I also suspect having two tasks to alternate between will help prevent writer’s block. It’ll be interesting to see.